The Ed Mirvish Theatre (formerly the Canon Theatre) is a majestic old theatre in the heart of downtown Toronto, just right across from the Eaton Centre and Dundas Square. Designed by famous architect Thomas Lamb, the theatre originally offered old school vaudeville shows and motion pictures. Built in 1920, it was the largest theatre in Canada and one of the most glamorous and elegant theatre venues in the city. The theatre was comprehensively refurbished to bring it to its former glory, and in 1989, exquisitely decorated, grand theatre reopened to rave reviews. Today's Ed Mirvish Theatre, with its decorated ceiling, gorgeous lobbies, grand sweeping stairway, ornate chandeliers and dramatic plaster work provides you a stunning and luxurious aesthetic that not many theatre settings manage to capture. With its excellent acoustics, great sightlines and comfy seats, this live theatre is a perfect example of classic entertainment location that never loses its charm, even after almost 100 years of service. The charming old theatre adds reverence to any performance  whether it's theatrical act, opera, concert or comedy. The theatre has seen a number of famous productions take place on its stages over the past few years, including The Phantom of the Opera, Wicked, Billy Elliot, Sister Act, Spring Awakening and The Wizard of Oz. Definitely, there are plenty of reasons for you to visit this outstanding theatre and once you have experienced a performance there, you will understand why it's one of Toronto's most popular theatre venues. The Wizard of Oz is a new production of Andrew Lloyd Webber, based on MGM's classic film of 1939. The musical extravaganza offers all the favourite songs and characters from the super-hit movie, along with few new songs. Take the journey through the magical land of Oz and enjoy this fabulous musical at Ed Mirvish. Below you'll find compilation of cherry-picked hotels near the theatre, many of them are just steps away from the theatre. 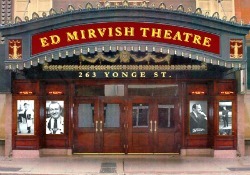 Please visit www.mirvish.com for more information.